Merry Christmas, everyone! I was trying to remember Christmas 2011, the last time December 25 fell on a Sunday, but can't seem to remember anything about it. It feels so weird. Do you celebrate on Sunday or Monday? Or do you do something on both days? We did dinner and gifts yesterday (Sunday) for the simple reason that my mother refuses to cook more than once per week. Today we'll enjoy leftovers and maybe a babka, if I can get my act together. Getting my act together has not been the easiest. My birthday was two weeks ago and I still have not finished baking my birthday cake. Maybe that's what I need to work on tomorrow? No, Tuesday is also a holiday (Boxing Day) so I think I'll do it then. Maybe. Well, if I'm turning on the oven for babka, I should just do the other layers of the cake too. Makes more sense - especially since gas may finish any day now. I think it's waiting until next Saturday night to finish. Stores will be closed until Tuesday. Perfect timing. But forget cakes - I'll get into why I have not been baking cakes when I finally return to Bundt Bakers. Now, it's time for muffins. I thought I'd add some dried fruit and make this month's muffins a bit seasonal. I know, I know. I mentioned that I don't like dried fruit. I still don't but here's what happened. 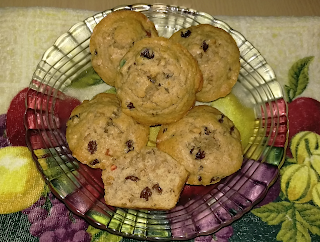 I baked this year's Christmas fruit cakes and as I was baking, I thought, well, why not try them in a muffin? I know I probably still won't like them but I keep trying. Also, my friend's wedding cake was a light fruit cake instead of the heavy black stuff and it was AMAZING. Had I known how delicious it was going to be, I would have gotten two more slices. I need to be there on the first anniversary when they cut into the top tier. Right now there's a tiny piece in my freezer and I'm treating it like fine wine - waiting for a special moment to enjoy it. Yes, it was that good. I don't remember now if the wedding cake had the dreaded mixed peel. 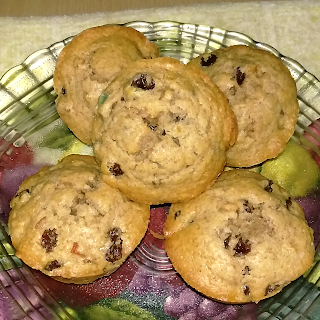 But I theorized that maybe in muffin form and with much less fruit involved, I could tolerate stuff. After all, I only recently started being OK with raisins. I just kept eating them until they didn't bother me anymore. I loved the muffins! Dried fruit and all. 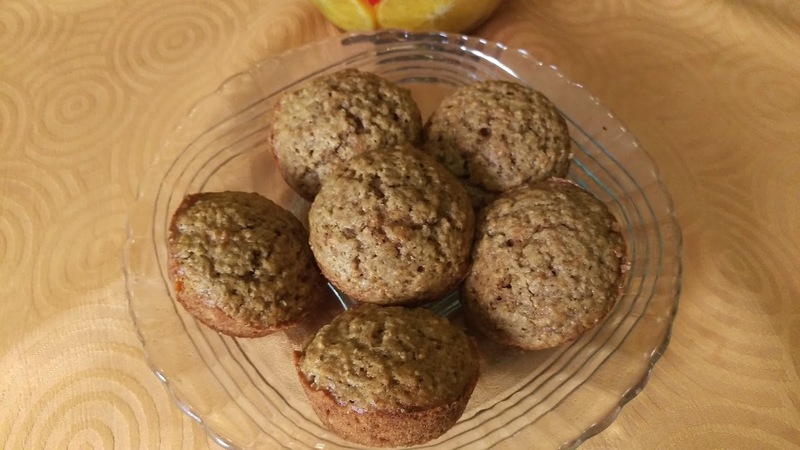 I didn't use a ton of fruit so the ratio of muffin to fruit is so that I could bite into a muffin and not have to deal with an entire mouthful of fruit. 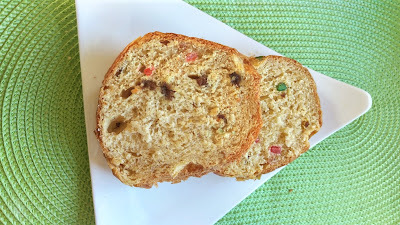 Two thumbs up for fruit cake in muffin form. Next I'll try some of the blended fruit that I used in the fruit cakes. I'm not sure if I will like them. I won't have to bite into any fruit at all but then the flavour will be better distributed in the muffins. Tricky. As always, scroll down to see what the other bakers whipped up this month! Preheat oven to 375F. Grease a muffin tin or line it with cupcake wrappers. Drain the fruit and set aside. In a bowl whisk together flour, sugar, baking powder, cinnamon, nutmeg, and salt. In a separate container, whisk together the eggs, milk, oil and vanilla. Gently add the wet ingredients to the dry ingredients, mixing until barely combined and there are streaks of flour remaining. Fold in the dried fruit. Divide among the 12 muffin wells. 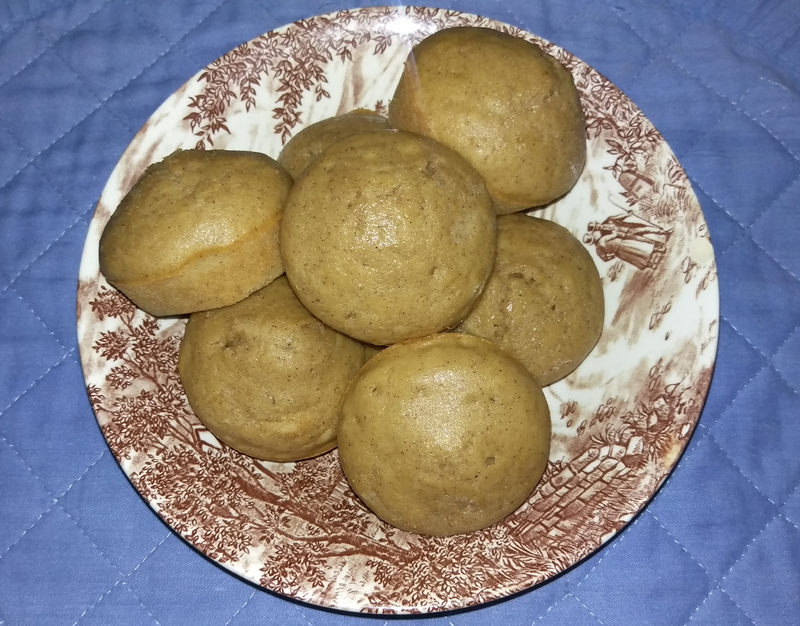 Bake for 15- 20 minutes or until a toothpick inserted into a muffin comes out clean. I just had the busiest but most fun weekend and need to sleep for about a week to allow my body to recover. This weekend was proof that maybe, just maybe, I am not as young as I pretend to be. Back in undergrad, weekends like this were the norm. You did it every weekend and felt no different the morning after. But hello, "old age"! So what did I do? I didn't sleep much on Wednesday night, partly because I became obsessed with a new game but mostly because I was anxious about something. Thursday was a long day of travel and the night was spent at my friend's bridal shower. Fun times but that was another very late night. I think I went to bed around 2am. Friday should have been an easy day but it turned into a lot of running around and another 2 am bedtime. Saturday was the wedding and you guessed it, back to bed at 2 am. Now, going to bed at 2 am wouldn't be so bad if my body wasn't programmed to wake up around 4:30 or so. By the time, I fell asleep again, it was time to wake up for the day. Sunday morning I went to a christening and a brunch then headed home. A really great weekend that my hurried words don't give any justice to but I am trying to get to the point of this post and this post is LATE. I am blaming it on bad planning and being too busy dealing with my nephew yesterday. He hadn't seen me since Wednesday and he had to make up for all the lost Aunty time. This month, rice and nutmeg won the Crazy Ingredient Challenge poll. My first thought was rice pudding. I always wanted to try it but I have a bit of a mental block against sweetened rice. I did try horchata and it was way better than I expected so there was hope for rice pudding. 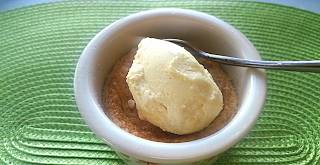 I talked myself out of it several times and came up with a few baked dishes that involved my favourite ingredient - flour - but in the end, I had no time so it was back to rice pudding. I decided to try a baked custard version instead of cooking it on the stove. And I slightly regret that. This custard is not as creamy as I would have liked and I can see the rice grains. I don't want to see the rice grains. I did think of blending the mixture but opted not to. That would have taken care of that issue. The flavour is great though and I just have to overcome my mental block against sweetened rice and seeing the rice grains won't make a difference. Too late to blend them now. Preheat oven to 300 F. Grease 3 half cup capacity ramekins. Mix all the ingredients together and pour into ramekins. Alternatively, you can blend all but the raisins then stir in the raisins. Bake in water bath for 20 minutes or until the custard is set. Serve warm or chilled with whipped cream. I topped mine with ice cream. I take no responsibility for this panettone being untraditional. You can blame King Arthur Flour for that. I have never even had panettone so I just did exactly what they told me. I couldn't even pronounce panettone until Thurs evening so you can't really expect traditional from me. And yes, King Arthur okayed the Bundt pan too. And if that is the most egregious error of them all, I am perfectly fine with that. Sure, I could have tried to fashion one of those paper things but the Bundt pan was just too easy. 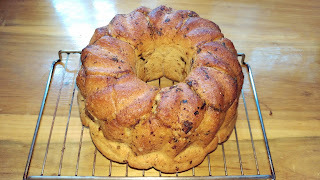 It was the Bundt pan or a rum and raisin braid. My friend tut-tutted my braid - something about not challenging myself - so here we are. 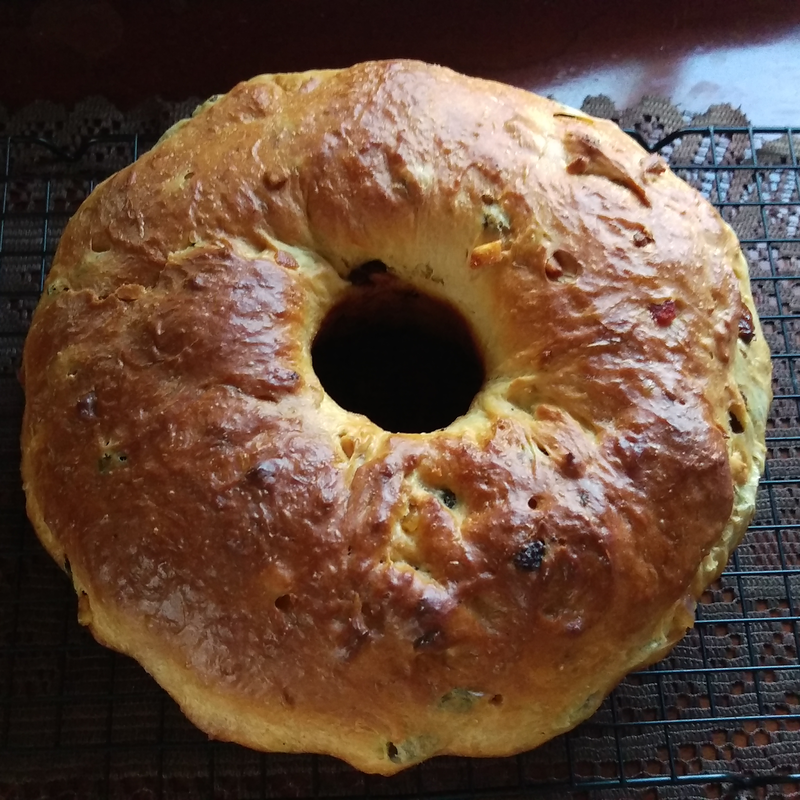 The panettone was easier to make than I expected. You definitely want to use a mixer because it's an extremely sticky dough but it comes together quite nicely. I am actually not a fan of dried fruits but I tolerated their presence here. I soaked them in some rum and orange juice and the flavour of the bread itself was enough to get me to ignore the fruits. Christmas is hard when you don't like dried fruits! Well, perhaps it's no so hard. 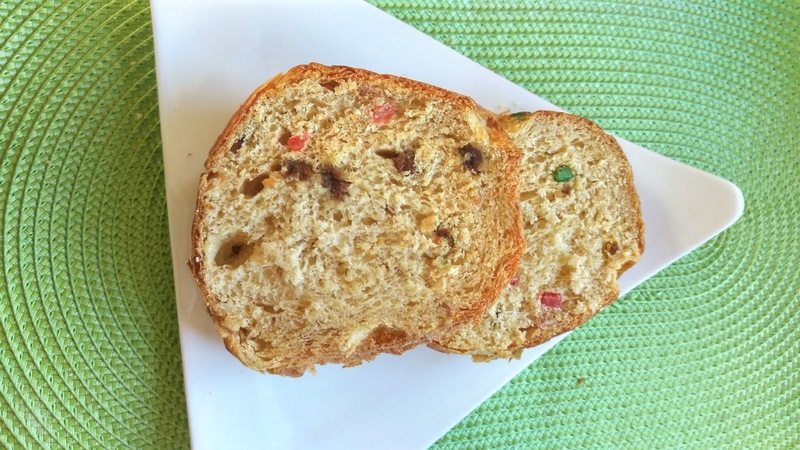 There are lots of holiday breads below and they don't all contain dried fruits. Thanks Stacy for hosting this sweet holiday edition of Bread Bakers! 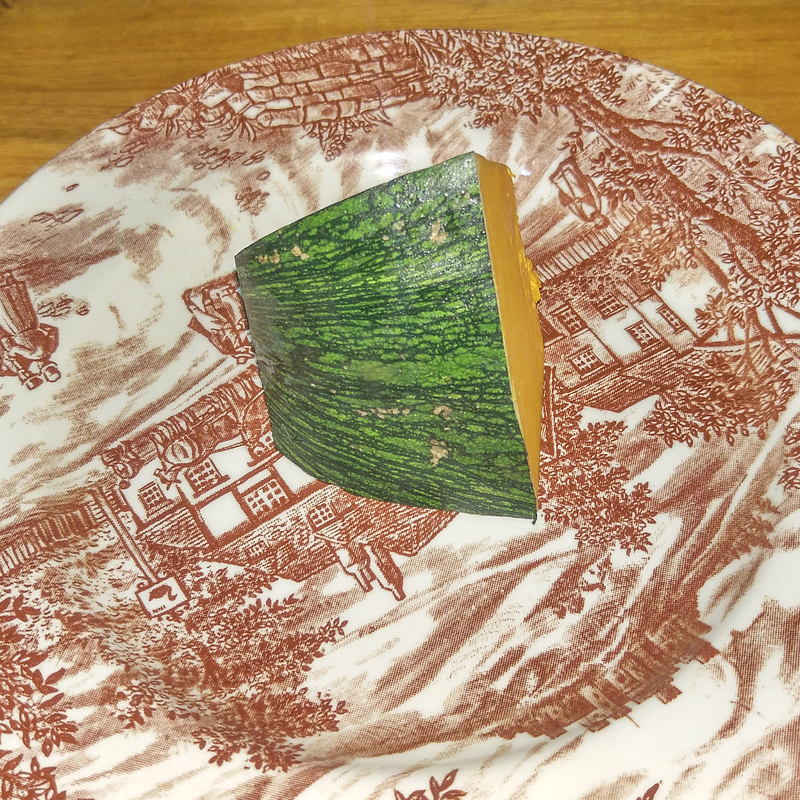 I did not make any changes to the King Arthur recipe so I won't post it here. Oh, wait, I did soak the fruit mix of orange juice and rum. You should definitely do that. More rum than orange juice. And I used lemon zest instead of Fiori di Sicilia as suggested in the tips. Here’s the html for the wording: #BreadBakers is a group of bread loving bakers who get together once a month to bake bread with a common ingredient or theme. Follow our Pinterest board right here. Links are also updated each month on this home page. My five year old nephew is going through what I hope is a phase. It's an "I don't want anything to eat; I just want to sit and watch YouTube" phase. After school, he comes to see me and if I let him, he will sit and watch YouTube for five hours. Occasionally, he will want to pause to "battle" and play with the dog. But otherwise, it's all about YouTube. "AJ, it's time for dinner." "No, I'm not ready yet." "But then what will I do with my phone?" It's a problem that we're working on. It occurred to me that I could get some food into him (healthy or not) if it was portable. Foods that he could eat while mindlessly watching unboxing videos. I decided to start with muffins. He likes cake so something that looks almost like a cupcake should be good, right? 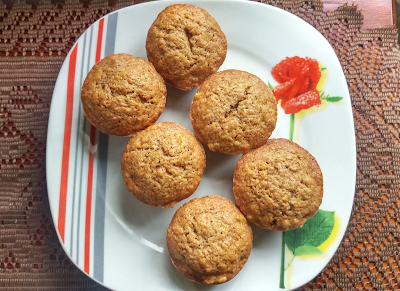 I went with carrot muffins because I had just made Food Lust People Love's carrot cake and saw that one of her carrot muffins recipes was pretty similar. One afternoon, I quickly whipped them up before he got to the house. I was taking them out the oven when he walked through the door. My brother immediately grabbed a hot muffin out of the pan. I waited until the others cooled then presented a muffin to AJ. 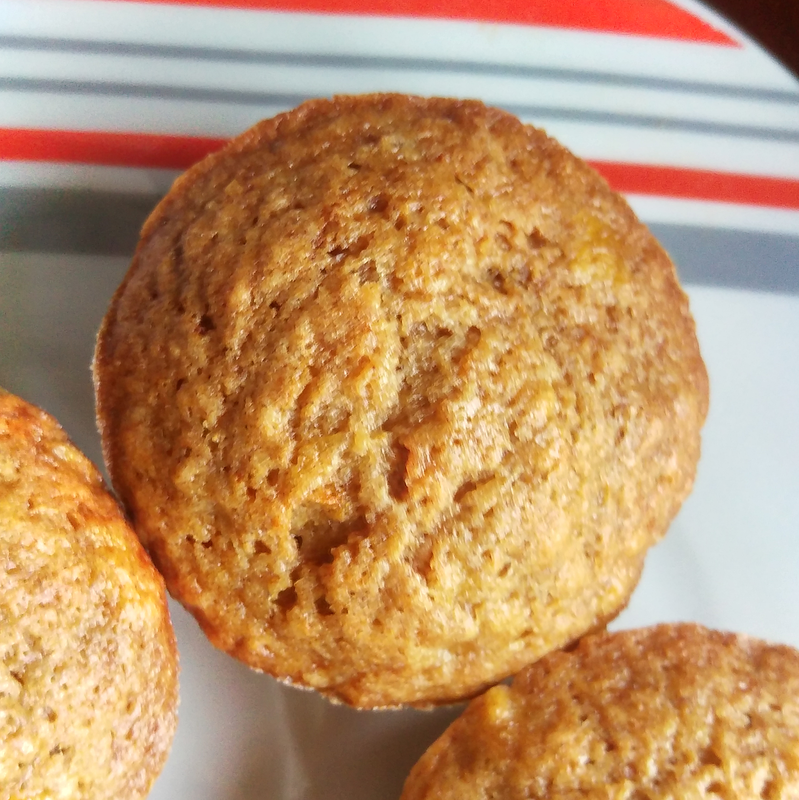 I wish the rest of this story was that he loved them and couldn't wait to have more and ever since then I have been baking hundreds of carrot muffins. I wish. "Have you ever had a muffin?" "Then how do you know that you don't like them? Please try it." This was said while pushing a piece into his mouth. He then spat it out and repeated, "I don't like muffins, I said!" I assure you that the muffins are delicious! Don't let my picky nephew sway you. We all happily ate that batch and then I made more that we happily ate again without offering him any. Muffins are not the answer to the refusal to eat. I don't know what is. But hopefully, one day soon, I will find something that he will happily put down YouTube to eat. 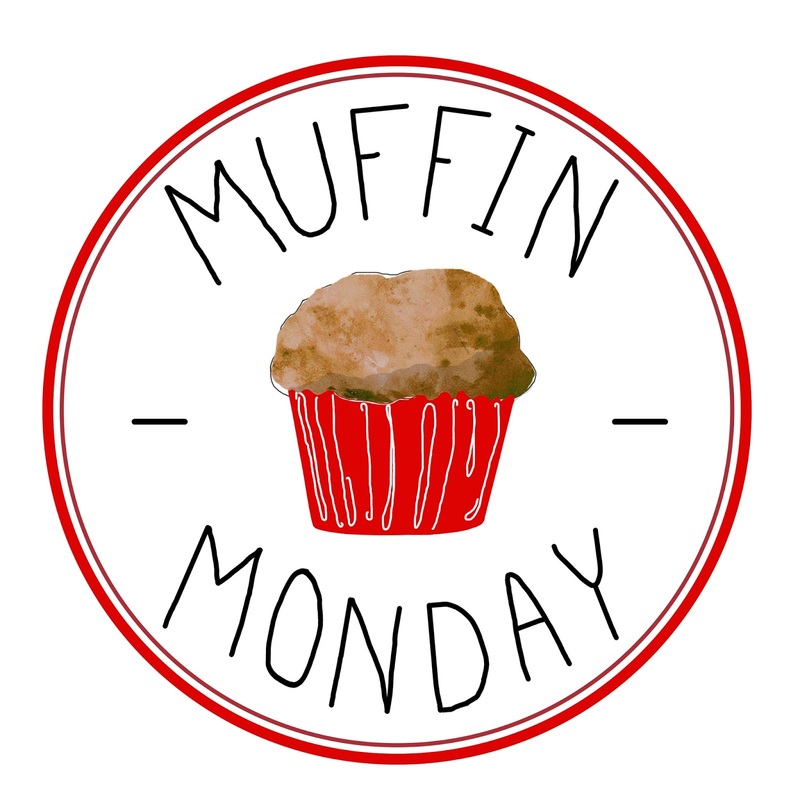 Be sure to check out the other muffins for Muffin Monday below the recipe! Peel and chop the carrots then cook until fork tender. When the carrots are tender, mash and set aside to cool. Preheat oven to 350 F and grease a 12 cup muffin pan. Whisk together flour, oat flour, brown sugar, ginger, baking powder, cinnamon, and salt. In a separate container, whisk together eggs, oil, and milk. Add the wet ingredients to the dry ingredients. Gently stir together until just combined. Divide the batter among the muffin wells. Bake 20 minutes or until a toothpick inserted comes out clean. Oy with the [pumpkins] already! Please tell me that you get that reference. Please also tell me that I am not the only one frantically re-watching seven seasons of Gilmore Girls in order to be ready for The Revival in November. I'm not? Great! So which episode are you on? I just started and am on season 1 episode 13 and by my calculations, I am a day behind schedule. No worries though - we have a holiday weekend coming up and methinks I will spend more than a little time watching Gilmore Girls. Some persons will be gallivanting at the beach, I'll be curled up watching Gilmore Girls. I'll pretend to have a life after November 25. I'm not even ashamed to admit that I have already watched the series at least 4 times. The last time was at least 5 years ago though so it's definitely time for a refresher.To make this viewing a little different, I am also listening to the Gilmore Guys podcast. Two guys talking about the Gilmores. Quirky but fun. I could go on and on about how much I am loving Netflix' promotion of the series. The Instagram photos are fun. But turning coffee shops across the US and Canada into Luke's diners? GENIUS. As I was saying, I won't dwell too much because I know that you already know these things. You feel the same way. You're binge watching with me too and counting down the days to November 25. 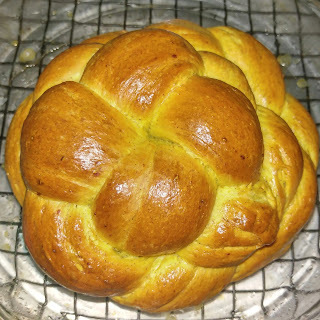 I guess we can then move on to pumpkin challah. Tired of pumpkin yet? I probably would be if I had hopped on the pumpkin bandwagon earlier. The theme for this month's Bundt Bakers is fall fruits and vegetables. There was definitely a lot to choose from but I still found myself gravitating towards pumpkin. I just have not used it often so it still feels new to me. 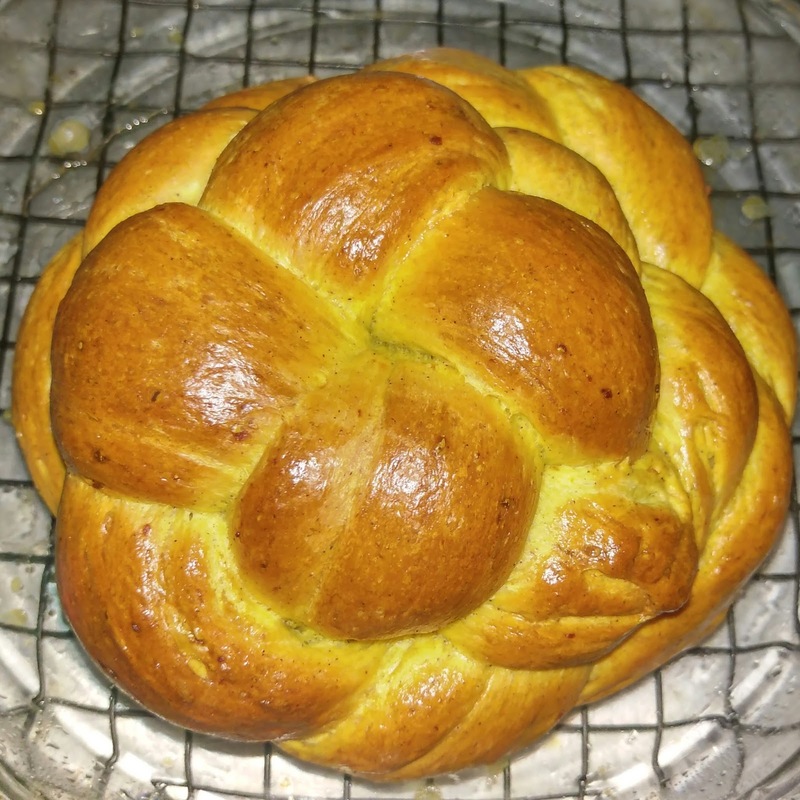 I love braiding dough so I easily gravitated towards making a challah. It's definitely not traditional but it sure is delicious. Whisk together eggs, pumpkin, shortening, sugar, yeast, cinnamon, salt, nutmeg, and ginger until sugar is mostly dissolved. Add the flour and enough water to form a soft and slightly tacky dough. The dough should not be sticky. Knead until it's soft and cohesive then placed in a greased bowl to rise until doubled. The length of time will depend on the temperature of your kitchen. When the dough has risen, divide the dough into two equal pieces. Divide each half into four equal pieces. Roll the pieces into logs about 12 inches long. Braid each set of four pieces into a round braid following the instructions here. Let rise until doubled. Before the braids have doubled, preheat oven to 350 F. When the braids are ready, brush with egg wash then bake 25-30 minutes or until golden. It would take one of my most favourite things in the world to bring me out of Foodie Extravaganza hibernation - CHOCOLATE. This month we are celebrating chocolate! I don't even know how long it has been since I have participated. Too long. Not my intention at all but life happens, apparently. As I type this (late Sunday night), I am listening to news reports about Hurricane Matthew. Up until last night, Matthew had us in its sight and was making a beeline towards us. Now, it has shifted slightly east and is heading towards Haiti instead. Bittersweet news. We are of course ecstatic that we won't have a category 4 hurricane passing directly over us but poor, poor Haiti. They can't handle such a major hurricane either. Matthew is still several hours away (roughly 415km away moving at 8km/h) but the outer bands are already causing major flooding in Kingston. Even though it seems we won't get a direct hit, Matthew is huge so we will still be heavily impacted. I live on a flood-prone street so with talks of Matthew bringing over 25 inches of rain, we are gearing up to be very very wet. Cupboards, closets and drawers have been unpacked. Chairs and other knickknacks will be put on top of tables so the water doesn't push them over. The roof could go. The beloved mango tree could fall onto the house. Cars will be flooded. But as Matthew rages out there, I will be calming my nerves with this chocolate cake. This is an extremely simple chocolate cake that I have baked several times over the years - I mainly make it as cupcakes when I want a small batch. I love it because it's egg free (can be vegan if you use non-dairy milk) so it makes dividing the ingredients very easy. It's also very moist. Once I used yogurt instead of milk + vinegar and it was even more moist. In this case, I made a simple one layer cake. Instead of the usual vanilla, I used a little almond extract. A little coffee perks things up and if you're feeling fancy, splash in some rum too. Frost it or not. I didn't here but there's a batch of frosting in my freezer so I may just have to practise my piping while Matthew rages. 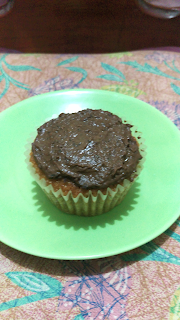 Chocolate frosting is amazing. The one in my fridge is vanilla. It will work just as well too. OK, not just as well. Nothing works just as well as chocolate. Forgive me for saying that. Edited to add: It's Wednesday and we are safe. No flooding here. In fact, it rained for no more than 10 minutes n Monday. Communities on the eastern end of the island had some flooding but for the most part, we are good. Extremely grateful for Matthew changing its course. But heartbroken for Haiti, Cuba and now the Bahamas. Be sure to check out all the other chocolate recipes below. Lots of good stuff and it isn't all desserts. Thanks for hosting, Kathleen! Preheat oven to 350F. Grease and flour an 8 inch baking pan. Mix milk and vinegar and set aside until curdled. Whisk together flour, cocoa, baking soda and baking powder. In a separate container mix together oil, sugar, and vanilla. Alternate adding the dry ingredients with the milk. Mix until combined. Pour into the prepared pan. Bake 20 minutes or until a toothpick inserted into the centre comes out clean. 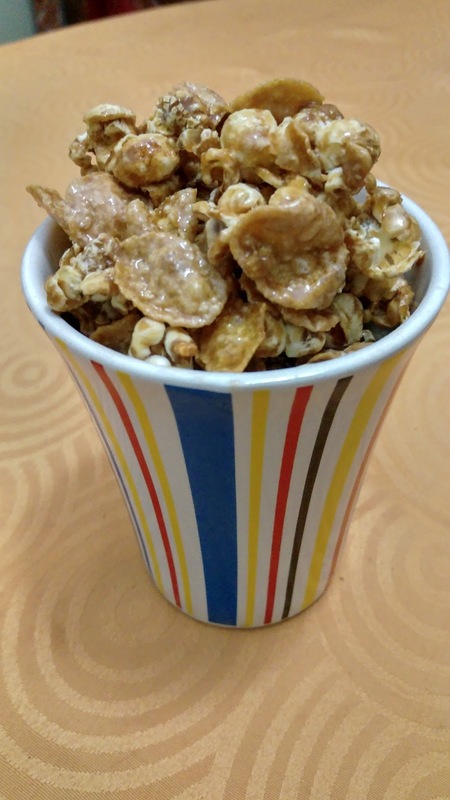 Foodie Extravaganza is a monthly food fest, where a group of bloggers all create and share a recipe around one of the monthly food 'holidays' as detailed in The Nibble. This month Kathleen from Fearlessly Creative Mammas is hosting and since chocolate day is October 28th, Chocolate is our theme. There are actually two other days that incorporate chocolate in October, the 14th is Chocolate Covered Insect Day and the 18th is Chocolate Cupcake day. We didn't want to get to specific though, so we will just say chocolate. Posting day is always the first Wednesday of each month. If you are a blogger and would like to join our group and blog along with us, come join our Facebook page Foodie Extravaganza. We would love to have you! If you're a spectator looking for delicious tid-bits check out our Foodie Extravaganza Pinterest Board! Looking for our previous parties? Check them out HERE. Now, check out these great chocolate submissions! I know, I know. You just read that title several times. And now you're wondering if I have lost my mind. Yes, yes, I have. However, that's very unrelated to the black bean frosting. I didn't even come up with the recipe. You can find anything on the internet, apparently. So here's how black bean frosting happened. This month's winning Crazy Ingredient Challenge ingredients are black beans and mayonnaise. There's nothing crazy about that. If the winning ingredients aren't crazy then I usually challenge myself to do something unusual with them. 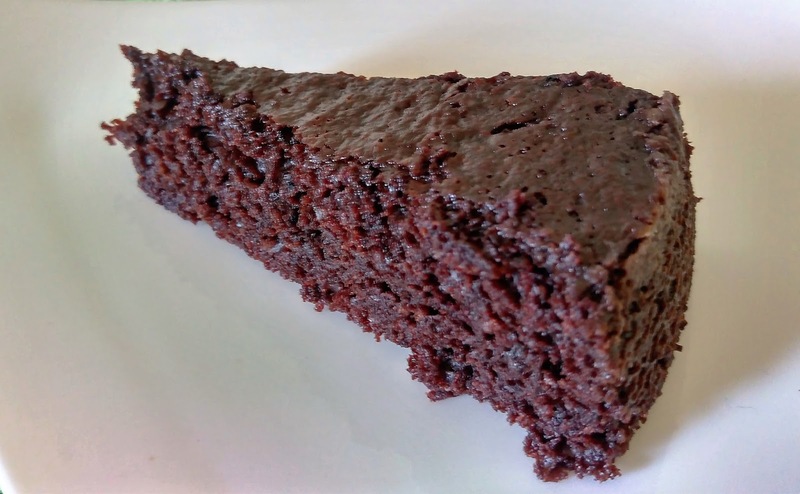 There's a bit of a buzz about black bean brownies. I tried them once and they just did not taste good. I contemplated trying again and then making a mayonnaise based frosting. But I just did not want to try that brownie again. I had finally settled on just making a savoury recipe. But one night I googled "black bean frosting" and this popped up. I took a leap of faith and tried the tiniest possible batcha and you know what? It wasn't bad! There was no black bean flavour whatsoever. You'd never guess that they were in there. My only complaint was the strong honey flavour. I am not a big honey fan though. I'd try another liquid sweetener or even just powdered sugar next time. But why put black beans in your frosting? Really, there's no reason to. It's just a fun little experiment that doesn't taste bad. I ate most of it straight from the blender with a spoon so trust me, it's good. And hey, I guess you now have protein in your frosting? The cupcakes are pretty good too. Very moist. Very delicious. Make them - with or without the frosting. Preheat oven to 350F. Line a cupcake tin with cupcake liners. 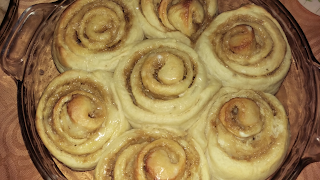 Whisk together the flour, brown sugar, cinnamon, baking powder, baking soda, and salt. Add the mayonnaise, milk and vanilla. Mix until combined them pour into the lined cupcake wells. Bake 17 to 20 minutes or until a toothpick inserted comes out clean. enough warm water to get a smooth frosting. Blend all the frosting ingredients until extremely smooth. Taste and adjust taste as you feel necessary. Don't use chunky peanut butter, I did and that made making it smooth harder. For this month's Bundt Bakers, Andrea challenged us sneak in something healthy into our cakes. I was stumped. The last time that I tried to sneak something into dessert, things did not go so well. I'm looking at you black bean brownies. You tasted like beans! Such a waste of chocolate. I keep seeing people talk about their amazing black bean brownies so I am guessing that I did something really wrong. Other than add black beans to perfectly good brownies, that is. Avocadoes are in season here and there are always at least 2 or 3 in the kitchen and we go through them quickly. I've used avocado in a drink before and loved it so I figured trying avocado in a cake would go over well enough. I've read before about using avocado to replace some of the fat in a cake. But most of the recipes tend to be chocolate cakes. I love chocolate cake but wondered if the chocolate would just be covering up whatever the avocado added. I decided to go with a simple vanilla cake. Much to my surprise, it worked. For the most part. The crumb had a tiny hint of green. There was nothing else to signify that there was avocado in mix. But the cakes felt a bit heavy. I figured this was the price one pays for cutting out that much fat from butter. As I was closing my recipe notebook, I realised that I had made a mistake. I used milk instead of buttermilk. That buttermilk made a huge difference to the texture! 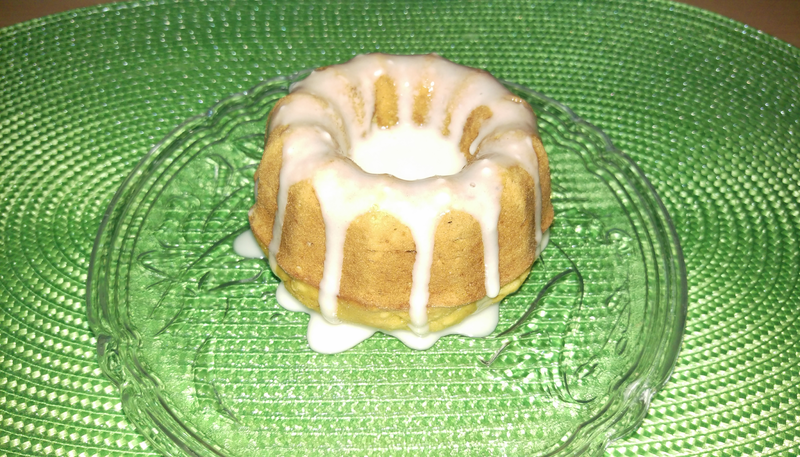 Thoroughly grease and flour 6 one cup capacity mini Bundt pans. Sift together flour, baking soda, baking powder and salt. In a separate bowl beat the avocado, butter and sugar until thoroughly combined. Beat in the vanilla and eggs. Alternate adding the buttermilk and the flour, mixing until just combined. Once it's all incorporated beat for an additional 20 seconds being careful not to overmix. Divide among the prepared pans and bake for 15 - 20 minutes or until a toothpick inserted into the centre of the cake comes out clean.. I know that I mentioned before that pumpkin is an all year round vegetable (yes, yes, I know it's really a fruit) in Jamaica. It's the base of most of our soups and a Saturday without a pot of soup bubbling on the stove is unpatriotic. Pumpkin rice is also a favourite of mine. What I never mentioned then was that our pumpkin is a wee bit different from North American pumpkin. Honestly, I just never thought about it much. 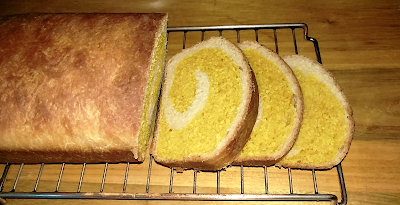 Someone brought it up to me when I mentioned that I needed to come up with a pumpkin bread for this month's Bread Bakers. Did I have a plan for addressing the differences? "Oh, yeah...hmm," was my response. I won't even admit to you how many years it took for it to dawn on me that we had green pumpkins and the once I saw in the US were orange. Maybe it's because I always reached for "calabaza" in the supermarket? Let me stop making excuses for my non-observant ways. Moving along. You can see that the flesh is still that really bright orange like the North American variety. It actually got a bit darker after cooking. The flesh is really sweet. After tasting nothing but the North American version for years, I was actually surprised by how sweet this was. The last time that I tasted canned pumpkin, I actually spat it out. Quite bland to me. I remember wondering why it tasted so bland when I grew up eating steamed pumpkin on a weekly basis and at no point did it ever taste like that. Different varieties, Kelly. Different varieties. I am actually looking forward to using this pumpkin in sweet applications. I was always on the fence about that before. I do wish that I could get some canned pumpkin to do some comparisons. Ah well. 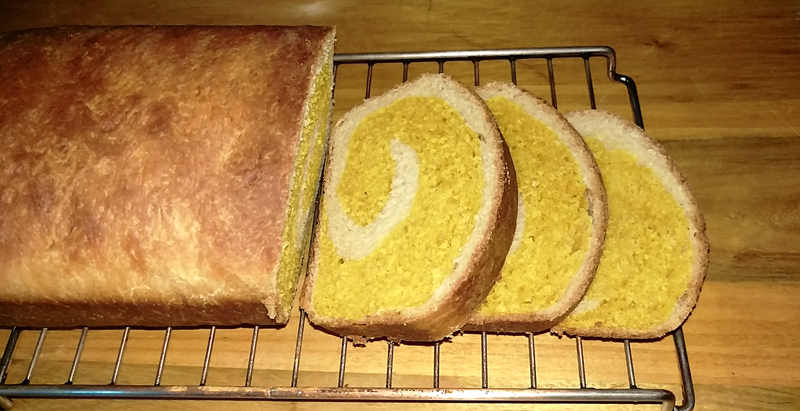 For today, I have a two toned pumpkin bread. It's a pretty simple bread even though it does require making two separate doughs. Both are pretty straightforward and come together pretty quickly. As always, be sure to check out all the other Bread Bakers below. Thanks to Kylee for hosting! Combine all the ingredients for the white dough. Knead until you form a smooth, cohesive dough that is slightly tacky. Set the dough aside to rise until doubled. Combine all the ingredients except milk for the pumpkin dough. Knead until you form a smooth, cohesive but tacky dough. If the dough is dry, add milk by the teaspoon. If it's too wet, add a little flour. Set the dough aside to rise until doubled. When both doughs are ready, roll out the white dough on a lightly floured surface. I rolled to approximately 9" x 7". Brush the dough with water. Roll out the pumpkin dough and place on top of the white dough. Tightly roll up the dough along the shorter side. Place the log in the greased loaf pan with the seam side down. Allow to rise at room temperature until doubled. Before the dough is doubled, preheat the oven to 350 F.
Bake the loaf for 30 minutes or until a thermometer registers approximately 200 F. Cool before slicing. Since I cooked my own pumpkin, and also due to the difference in variety, the water content may be vastly different from yours. Don't add any milk to the pumpkin dough until you have combined the other ingredients and determined if you need it. I did not need additional milk. I may be the slowest person in the kitchen ever. No matter how much I try to streamline the process, I seem to always end up spending all day in the kitchen. The other day my baking to-do list included potato rolls, Food Lust People Loves's carrot cake, brownies, and these plantain muffins. Knead, autolyze, cook, mash, mix, shape. It was a very long day. 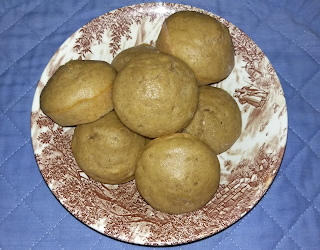 When I grabbed one of these muffins and took a bite, the achy feet did not seem to matter anymore. They were amazing. When I told my friend that I was going to make plantain muffins, she seemed a bit skeptical. But I persisted. 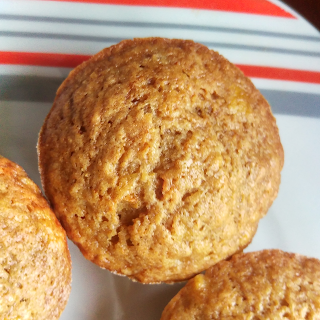 We all enjoy banana muffins, why not plantain muffins? How could that possibly be bad? It cannot be. That's the answer to that. Plantains are a breakfast favourite here. I love them twice-fried aka tostones. But the really ripe ones aren't the best for tostones as flattening them gets a bit messy. But now I have found the perfect use for them, that is, if I am not just eating them raw or fried once. 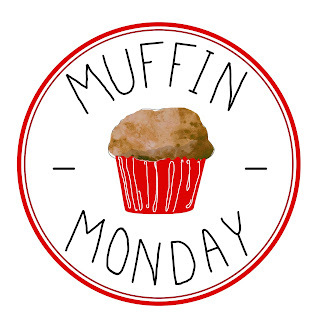 As usual, be sure to check out all the other Muffin Monday recipes below! Preheat oven to 350 F and thoroughly grease the wells of a muffin pan. Mash the plantain with the one cup of sugar. Whisk together the egg and the oil then add to plantain mixture. In a separate bowl, whisk together flour, cinnamon, nutmeg, baking soda, and salt. Slowly combine the wet and dry mixtures, mixing until just combined. Don't overmix! Fill each well about 2/3rds then bake approximately 18 minutes or until a toothpick comes out clean. I have been struggling creatively for the last few months. I kept telling myself that I am just stressed out by all the things that have been happening. Additionally, there's the lack of availability of ingredients that I'd like to use. But the reason finally hit me as I was falling asleep last night. Yes, there's a fair amount of stress but that usually gets me in the kitchen more. Baking is after all, therapy. My real issue is that I am not being inspired by the things around me, the ingredients available right here. I keep thinking in terms of American ingredients, closing my eyes to what is available. 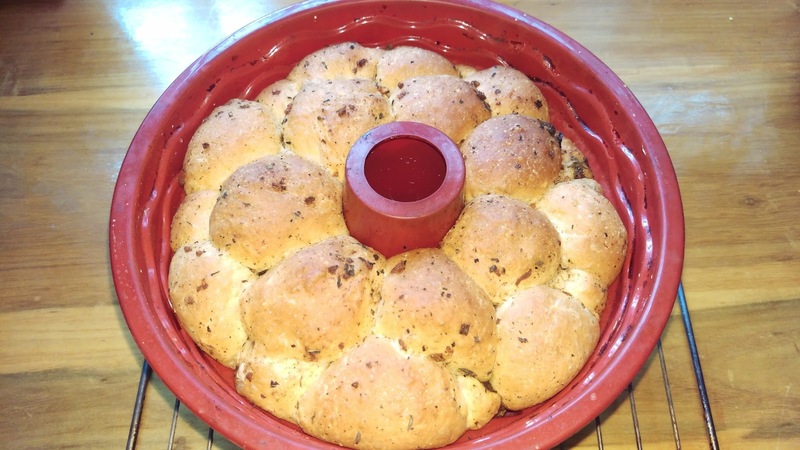 Take for example, this spicy monkey bread that I made for this month's Bundt Bakers. I used cayenne pepper in the herb oil. It was really spicy and absolutely delicious. But you know what would have been great too? Scotch bonnet peppers! Scotch bonnet peppers are not only spicy but have a unique flavour. Why didn't I reach for them? Just not thinking clearly. Now that I have identified part of my problem, I hope that this creative rut will end. I'm looking forward to creating with the things around me - and not dreaming about ingredients that I can't get a hold of easily. Thanks Sue for hosting this month's Bread Bakers! Remember to scroll down to see the list of other recipes this month. Combine all the dough ingredients and knead for 5 to 8 minutes. Dough will be soft but very tacky. Dough can be left to rise in the refrigerator overnight or at room temperature until doubled. While dough is rising, combine all the ingredients for the herb oil. 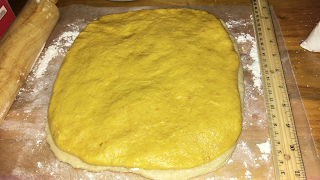 When the dough has doubled, divide the dough into approximately 32 pieces. Each piece should weigh about .75 oz. 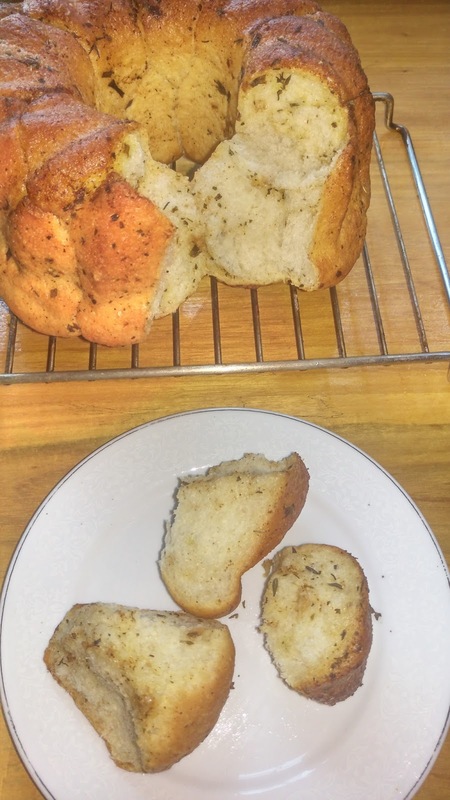 Dip each dough ball into the herb oil and then place into a Bundt pan. I used a 9 cup capacity Bundt pan. 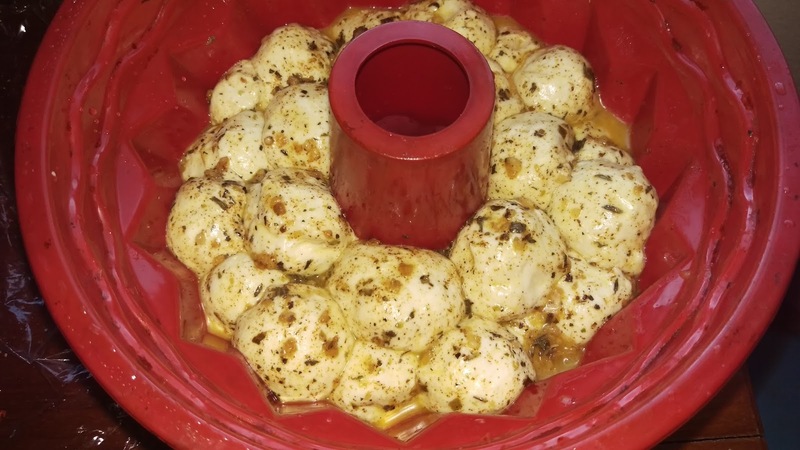 Pour any remaining herb oil on top of the dough balls. 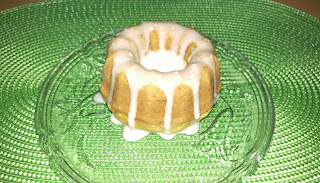 Cover the Bundt pan and let rise at room temperature until doubled. When the dough has almost doubled, preheat oven to 375 F.
Bake for 30-35 minutes until golden. Turn out on a cooling rack. Serve warm.